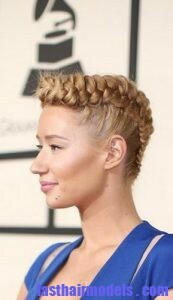 Iggy Azalea is wearing a hairline braid that is easily created at home within few minutes. It is one of the most unique hairstyle that is very simple to achieve. Anyone with short to long hair can achieve this hairstyle without getting support from anyone. To get this hairstyle, first comb your hair and take three inches section of hair from your right temple towards the left temple. Then take the remaining hair behind your head and secure it with hair pins. Next spritz your hair with water as it will help to continue your hairstyle very easily. Pull out about one inch hair section to the side over your head and create three separate sections in it. Try to cross this hair section to the middle part of your hair and cross your left hair section just over the middle part. Make sure to maintain all the three sections of your braid in one hand and keep the finger between each of them. Try to take small hair section from the scalp share it with the right hair section in the braid. Now you must cross the right hair section just over section in the middle of the braid and pull out another small hair section from the scalp for putting it over left side of your braid. Try to cross your left hair section on the middle hair section and continue this till you reach to the hair end before securing it with elastic band.